Heads of state, including Trump, are scheduled to begin addressing the UN General Assembly on Tuesday. On Wednesday, with the U.S. as the rotating president of the UN Security Council this month, Trump is scheduled to chair a meeting of the Council. Paul is author of the new book Of Foxes and Chickens: Oligarchy and Power in the UN Security Council. He said today: “The topic of the Wednesday Security Council meeting — Iran — was pushed onto the agenda in the usual ‘P1’ way, with the U.S. insisting on a debate on the Iran nuclear deal in spite of the opposition of the other members. “The U.S. is in clear breach of an earlier SC resolution endorsing and implementing the Iran nuclear deal. Will other SC members remain silent…? Russia and China are likely to point out this discrepancy. Iran will be in the room and likely to speak. He just wrote the piece “Trump at the UN — a Dramatist Seizes an Opportunity,” which states: “Trump has grievously weakened the UN and multilateralism. Who can forget the withdrawal of the U.S. from the Human Rights Council, the withdrawal from UNESCO, the demanded cuts to the UN’s core budgets, and the diminished U.S. contributions to many of the UN funds and programs … and the plan to destroy the International Criminal Court. John Bolton, Trump’s National Security Advisor, is famous for his hostility to the UN. 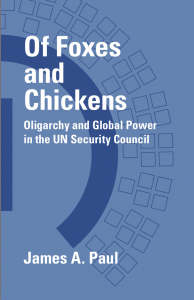 In his book, Of Foxes and Chickens: Oligarchy and Power in the UN Security Council, Paul writes: “Though the P5 [permanent five members of the Security Council] share the same powers and privileges, they are far from equals. They form a steep hierarchy, which is reflected in the language of UN insiders. First and foremost there is the ‘P1’ — the United States — with its unique and exceptional influence, far above the rest. Then there is the ‘P2’ — the duo of the United States and its close ally, the United Kingdom. Between them they largely run the show, with assistance from France, with whom they constitute the ‘P3.’ Finally, and well behind in Council influence, are Russia and China, for whom a special ‘P’ designation is not used. Senior P3 diplomats have openly stated that they — the P3 — ‘run’ the Security Council and largely control it.” The full text of the book is available online. Paul is also author of Syria Unmasked and was executive director of Global Policy Forum, a think tank that monitors the UN, for nearly 20 years. He was also a longtime editor of the Oxford Companion to Politics of the World and executive director of the Middle East Research and Information Project.